INTENSAE 5-Free Nail Lacquer: "X-Offender"
Today's nails feature INTENSAE - a brand that's been on my radar (and my wish list!) for quite a while now. I was super excited to receive a couple of shades to try out from their 5-free range recently and was instantly taken in by the sleek and stylish bottle design. 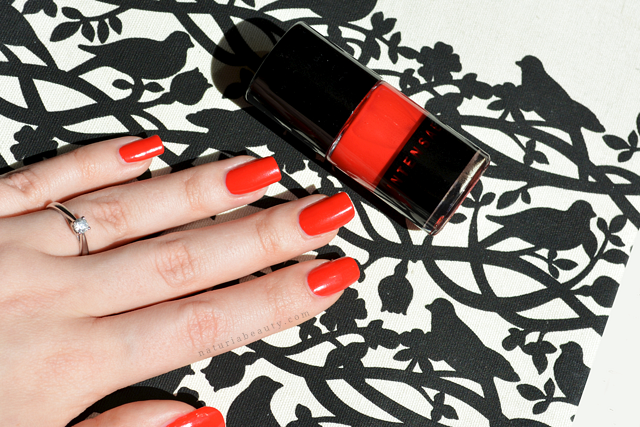 One of the shades I have is called X-Offender* which is easily the most vibrant, bright coral red I've ever seen in a nail colour! The formula of this nail lacquer is incredible. At first I thought the consistency would be too thin, but as soon as I started to apply I knew I needn't have worried as it's so intensely pigmented! After just one coat, the coverage was amazing, but I did go back over with a second coat for extra intensity. It's an absolute dream to apply, gliding on with no streaks whatsoever. The cap is oversized which makes it easy to hold and the brush is carefully measured to allow for effortless application and seems much better quality compared with other brands. The end result is a creme finish, which is showing no noticeable signs of wear or chipping after 5 days so far. I'm so impressed with INTENSAE's nail lacquer they've gone straight onto my list favourite nail colour brands! I highly recommend checking them out for yourself as the formula is one of the best I've ever tried! In the UK, INTENSAE are available from Content Beauty for £14.95, or direct from INTENSAE for €16 within the EU, Switzerland, Norway & Monaco. What do you think of "X-Offender"? Have you tried INTENSAE Nail Lacquer before? Oh Ria I wish I had your nails! The colour is gorgeous I love it!